A study group resource for men produced in association with: CVM and Sorted. Men remember moments. Most of us could relive tales of epic sporting memories, spontaneous risks and mad late night antics that will stay in our daydreams until death, even though we'll forget our wife's brithday. There is something about a man's DNA that draws him to memorable moments. It's why so many men love a good film. When a bloke refers to 'that moment' in Die Hard, 'that gag' from Dumb and Dumber, or 'that scene' in Top Gun, there usually comes a harmonised "Ah yes" from everyone in the room. As Christian men, we often preceive another dimension in the cinema. We see themes which correlate with the teachings of Jesus as we watch scenes portraying justice, forgiveness and courage in seemingly non-spiritual entertainment. We can understand a plot in our heads, but there are times when something in our soul connects to a particular character or circumstance. As well as interviews with iconic movie stars, this CVM and Sorted resource will look at prominent themes in five of the most successful films of all times. 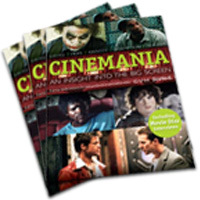 Cinemania is an ideal tool for a group study but can also be used by individuals wanting to explore biblical themes in a new way.